One of the perks of being a graduate student is the ability to claim to your non-student friends and family that you are both employed and on vacation two full weeks into January. Of course, vacation is a subjective term–the work never really subsides and will surely pile up if neglected. Still, it all beats working in an office (ironically, I write this sentence from my office), which is why it is tactful to shut your mouth and act busy this time of year. Winter break is also a great opportunity to escape the ivory tower and speak to people who have not been self-selected to have any interest in your research. While this can result in awkward and humbling situations, my recent experience has instead been extremely positive and has affirmed for me my impression that lay listeners are actually very interested in the kinds of questions that we pursue as primatologists. 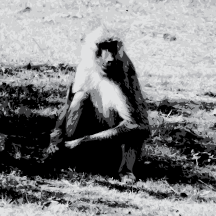 Among my favorite questions recently posed to me: “Are monkeys smart enough to take over the world?” (maybe). As a New Yorker, I naively assumed upon moving to St. Louis that I would be able to get by just by walking and taking public transport. One semester later, finding a car has made it to the top of my winter agenda. It was riding a taxi on my way to a car dealership that I had my most memorable anthropology discussion yet. After the driver found out that I was an anthropology student, instead of the customary “you do what?” followed by uneasy silence, his eyes lit up and he proceeded to recount to me emphatically his opinions about Margaret Meade, the Leakey family, and Piltdown man, among others. Eventually, we made our way to the topic of baboons. Did I know, he asked, about the leopard who, when confronted with a baboon infant bundled within her fresh kill, took it upon herself to care for the infant? Was this not proof of a morality not so different from our own? Not having heard of this, I told him it was not possible, a leopard encountering a baby baboon eats the baboon. To not do so is against her nature, will not happen, cannot happen. After all my cynicism, my certainty, I was wrong and my friend the cab driver was right. I have had over a week to digest the video and it is still as shocking as it was the day I first watched it. Shocking not because the behavior surprised me, but because I think that it shows an important point about what we do as behavioral scientists. However we construct our models, however we evaluate our hypotheses, we cannot ignore that our subjects are unique individuals with unique personal histories and chance encounters are continually occurring that can shake up our opinions and perspectives. As scientists, it is our charge to be skeptical, systematic, objective (and even more so when listening to colored commentary such as in this video). As observers of nature, however, telling the story of the lives and interactions of our animals might be just as important of a responsibility. Emerging from this may be the occasional offbeat story that might just blow our minds away.